Blog > What Are Those Yellow Elevated Bumps Outside The New Mall? Have you ever noticed those raised colored domes that lay across the sidewalk outside of building entrances and exits? Known by officials as ADA truncated dome pads, these ADA compliant pads help people with disabilities, specifically the visually impaired, be aware that they are walking from a parking lot to a sidewalk or entranceway to a building and vice versa. 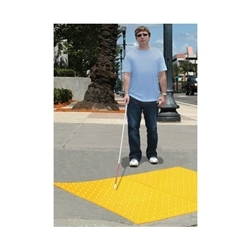 The heavy-textured area on the ADA pads serve as a detectable warning that are made to be felt underfoot or with a walking assistive devise such as a cane. For individuals with low vision or who are blind, going from a pedestrian walkway to a parking lot or street crossing presents obvious dangers, such as unknowingly walking in front of a moving vehicle. Installing an ADA pad, which is required by law, enables such individuals to tactilely recognize these transitional, pedestrian to roadway areas. The ADA Accessibility Guidelines (ADAAG) for installing ADA dome pads, which was temporarily suspended from 1990-2001, states that such ADA compliant pads are installed on surface areas such as handicap accessibility curb ramps and other paths where walkways and parking lots come together. New building facilities are required to have ADA pads installed in such areas. For safety reasons public transportation areas, such as subway, train, trolley and bus platforms must also use ADA compliant pads so that visually impaired individuals are made aware of where the platform cliff ends. The two main types of ADA dome pads include ones for buildings under construction (or cast-in-place models) and ones for existing buildings (retro-fit or surface-mount ADA pads). The former must be installed during the time of the building’s construction as they are set in concrete while the latter can be more easily added to a completed concrete walkway or path. For the retrofit pads, the materials must be comprised of the highest quality or there may be issues with the installation causing a falling hazard for the ADA pad.